Yesterday was a tale of two two halves – crap and brilliant. Up at 4am, get ready and leave the house at 4.30 to get to Brighton Marina for first light and a crack at the herring that have been showing. I arrived on the East arm at about 5am, two hours after high water, to a flat calm and clear sea, slightly overcast sky and no wind. I headed out on to the virtually empty arm to bay 32 and firstly setup a scratching rod, using a size 2, two hook flapper baited with lugworm and ragworm and cast this out about 30 yards, just to see what, if anything else was about. On each subsequent cast, I varied the distance to cover more ground. The other rod was set up with a string of 5 size 10 Sabiki lures and a 3oz lead which I then started working. On the 3rd cast, I had a herring on, right up until it got to the wall, at which point, it flicked off the hook and was away. There were no other takes for the rest of the morning. I did have two pinwhiting on the scatcher rod while i had been working the feathers though. By 10am, it became obvious that no herring were going to show until later in the day, so I decided to head off home and return later to catch the 4pm high water. I returned to the East arm at around 2pm to find it a bit more crowded than earlier but managed to get a space at bay 35. The Easterly breeze had picked up a bit with a resultant to chop to the water surface. It was still an overcast sky with occasional breaks of sunshine. I again set up a scratching rod using the same rig and bait as before and cast that out. The herring rod was set up exactly the same as before. I started working the lures through the water, just bouncing the lead of the sea bed in a sink and draw fashion. The current was quite strong on the run up to high water and using such a small lead, the lures were being dragged laterally at quite a rate. With so many people having lines out nearby, it beame difficult to prevent manoevre through them, so decided to quit for a while until the current died down a bit. Anna and Alex had by now turned up for a flying visit after doing the shops in the marina. While Anna and I chatted, Alex spent time exploring but failed the “sit quietly, watch the rod and see if the end moves” test but he did manage two retrieves of the feathers before declaring enough. 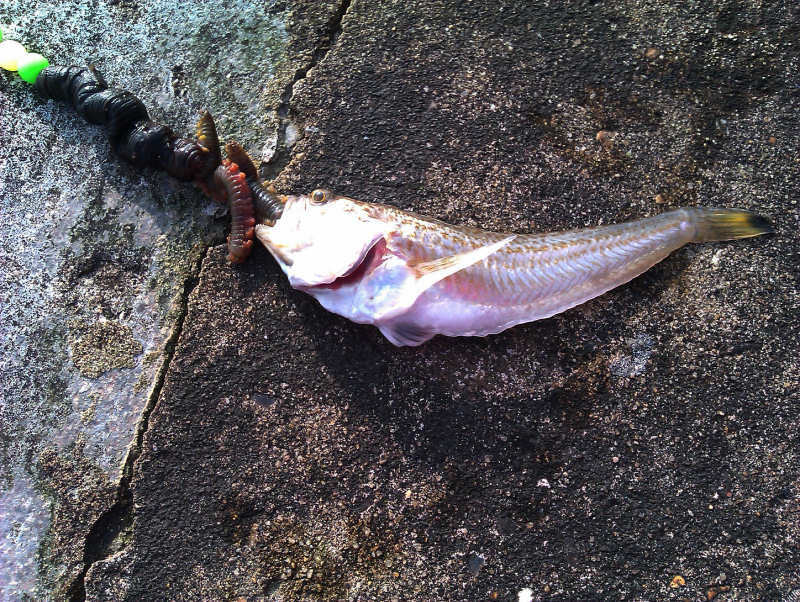 While there, they witnessed my one and only catch on the scratching rod – my first weever of the year, that had taken a worm bait that was bigger than itself. As I’m awaiting delivery of a new camera due to the demise of my old one, Anna managed a quick photo on her HTC phone. After they left, I had another go at the feathers and found that the current had eased a bit and working the lures was a bit less troublesome. Just to make sure, I brought in the scratching rod – it wan’t exactly doing much good out there anyway – and packed it away. 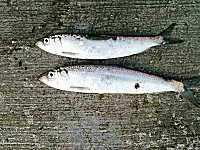 It was about half an hour after high water when the herring appeared, my first of the year was a safely landed double shot. It was then a steady trickle of ones and twos until about 5.30, when it went a bit hectic with a few more landed, along with a solitary mackerel in amongst them. Most were caught only a few yards out from the wall, while a few were out at about fifty yards or so. I did get a couple of pictures but had to use the iphone camera, so not brilliant. By 6pm, it was over and they departed as quickly as they came and in that time, I had managed just shy of two dozen herring and the mackerel – a nice few suppers and lunches shared out. So after a disappointing morning to a fantastic afternoon, some nice fish and a great day out. Managed it all while wearing ‘normal’ clothes, got a bit of a red head from the sun – summer is on it’s way. I was thinking the other day that I haven’t fished Seaford Beach since January, so decided to have a go there last night to see what’s about. Not being able to rely on catching mackerel there, I decided to continue my launce (sandeel) for bass experiment. I had some left over lugworm as well and thought I’d use that up on a scratching rig. When I got to the beach, it was about two hours into the flood tide and I saw that there was some weed present but didn’t look too bad and was certainly fishable. The sea was pretty calm with just a small swell and a bit of movement surf-wise. There was no wind to speak of and the sky was cloudy with sun breaking through at times. I set up the scratching rig first, a size 4, two hook flapper baited with the lugworm which I cast out about fifty yards. I then set about the bass rod which I would use later on and used a long link running ledger combined with an eight foot trace and a 4/0 pennel to be baited with the launce. These were frozen ‘Ammo’ and were a pretty good size, being about six inches in length and thick bodied. Since I started using these, I have found that the larger sized launce seem to work better than the smaller ones which have caught significantly less fish. First fish to be landed came in about three hours after low water and it was a double shot of a school bass and a small weever. Next in was a small thornback ray, shortly followed by a small Tub gurnard – all these came in before full darkness and fell to the lugworm. Once dark, I had another hit which turned out to be another school bass. By about 10pm and four hours into the tide, the weed started to become a problem – long strands of the ‘Spaghetti’ weed got caught up on the hook, sinker and leader knot. The best way to deal with this was to abandon the scratching rod and concentrate on the bass gear which I had by now deployed. While packing the other rod up, I heard the ratchet on the bass reel scream off as a fish took line. I picked up the rod and felt the fish pulling strongly and struck into it. 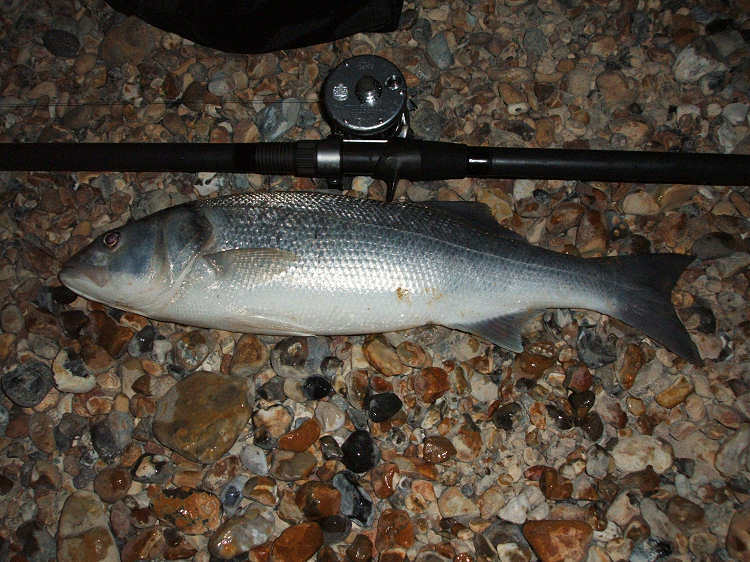 A short while later, a bass of around 2½lbs was on the beach but before I could reach it, the hook fell free and the next wave took the fish back. Ah well, at least I knew there were fish there. I re-baited with a fresh launce and cast out again just beyond the breaking waves. Almost immediately I saw the rod lurch over and the reel sing again, I lifted into the fish which was on for a brief moment before going free – arse! Another fresh launce was cast out but nothing touched it – or so I thought. The rod was moving in a wave-weed like manner but when I retrieved it, I found a spider crab firmly attached. Unfortunately it wasn’t peeling, so went back. By now, it was about an hour before high water and the weed was getting to be a real problem; at least on this rig, there was no leader knot to worry about as it was a straight through line. I saw the rod moving and was about to bring it in, when it dramatically arched over and the reel screamed’ I picked it up and felt a reasonable fish on the other end. 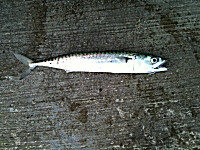 As it got nearer the beach, I let the waves carry the fish closer to land and soon a nice fish was on the beach – success! It measured 52cm and weighed in at a shade over 3lbs – not huge but very satisfying for my first session there in six months. The weed become intolerable around high water and the place was just unfishable – huge rafts of it could be seen in the waves and after a minute in the water, line and terminal tackle were smothered and being dragged along by the weight of weed in the current. I was down to my last launce anyway, so chucked it to give the fish a free meal on me before packing up for the night. Given that there was a nice variety of fish (although on the small side), I may give the marina a rest for a while and concentrate on Seaford a bit more along with Newhaven for the sole. Today’s challenge was to gather some mackerel for a sort of ‘Parent’s help out day’ our son’s school, whereby Anna would show the kids how the fish was cooked and then let them taste it. So with rod and feathers in hand, I headed off to Brighton Marina for sunrise this morning to bag a dozen. Hmm – ever wished you’d never volunteered for something? I got to the West arm at about 4am and started chucking the feathers out and got one almost immediately – looked like this was going to be an easy task, I thought. I had spoken to soon and obviously put the mockers on the morning. 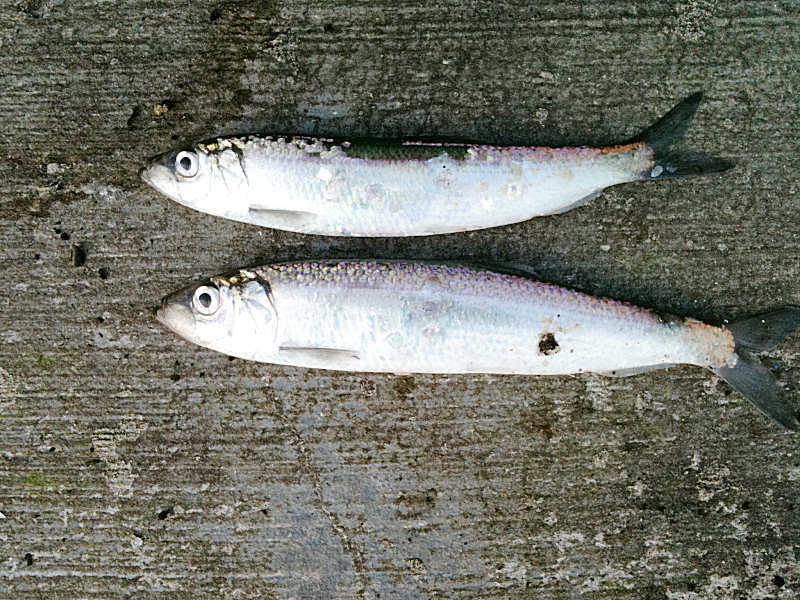 Over the next two hours, I only connected with two more mackerel, which to my dismay, dropped off at the wall. By 6am, the water was dropping fast, was starting to colour up and was choking in weed, so I decided on a move over to the East arm to try there. A short dash later saw me over on the other wall and chucking feathers there. The water there was also choked, with large rafts of that ‘orrible ‘spaghetti’ weed we had for so long last year. 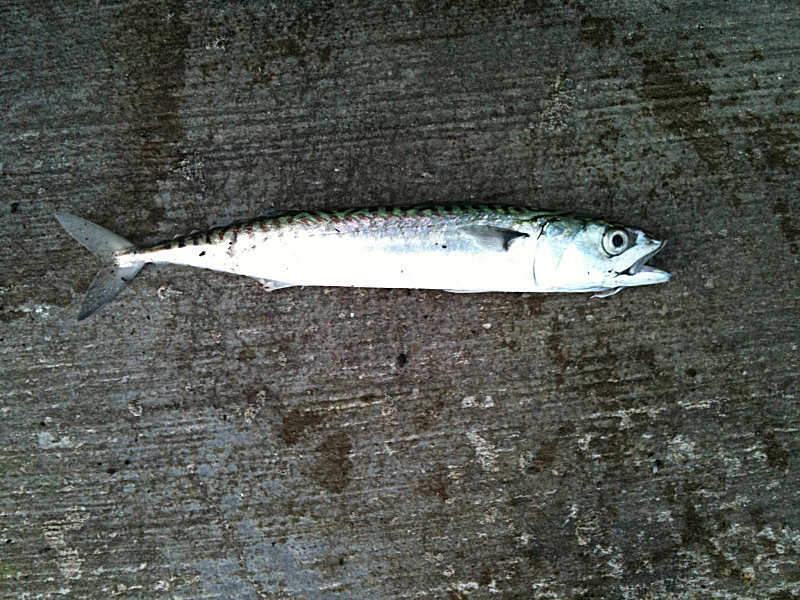 Anyhow, I carried on and after a few casts, had another two mackerel on, only to drop at the wall again. I changed over to some slightly larger lures and started with them, thinking that the slightly larger hooks wouldn’t pull out as easily. A few casts later and there was a fish on but felt different, very un-mackerel like, I got it up the wall and saw that there was a quantity of weed with a small fish buried in it all. 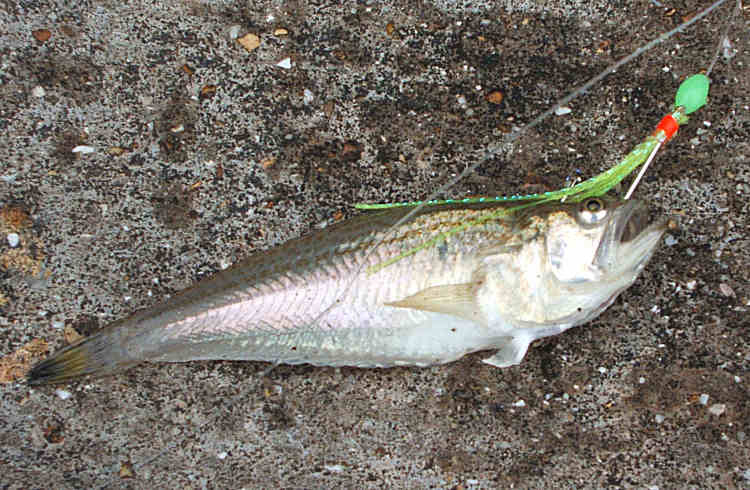 As I pulled the weed off, I saw that the fish was a small Lesser weever which had been foul hooked. I know most would recognise this poisonous little bugger but some may not, so thought I’d get a picture just to act as a reminder for everyone to be aware. 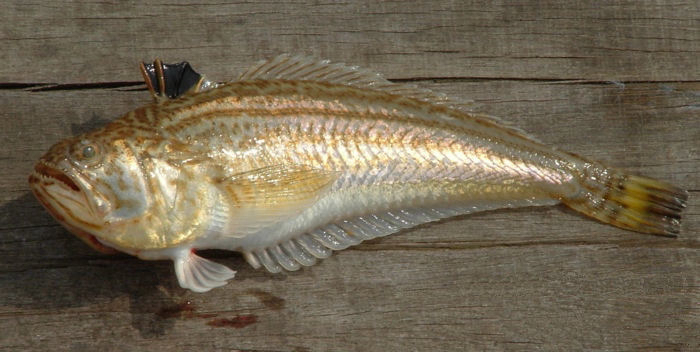 DO NOT HANDLE THEM, the black dorsal fin and gill covers have spines that will inject venom when picked up. They are often mistaken for small Pout when caught in low light situations or when covered in weed. Please make sure you know what a fish is before handling, unhooking etc. I very carefully unhooked the creature with pliers and lobbed it back before continuing with my efforts. By 8am, I had only had one more fish which managed to get off the hook soon after it had taken the lure. With the water dropping ever faster, this looked like being a fruitless activity and decided to call it a day, so walked back to the car with the one solitary fish looking lost in a rather large and optimistic bucket. A total contrast to a week ago when the place was alive with mackerel. The one benefit of my failure was that I would get to sit at home with a coffee, instead of standing in the school looking like a muppet, while Anna cooked fish for the little darlings who would in all probability not eat it anyway – result! 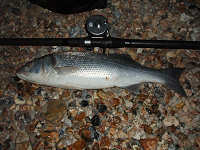 Fished at Tidemills area near Seaford the other evening from about high water down to low. Used some lugworm, which to be honest was a bit past its sell by date and calamari. Had a couple of bass of around the two pound mark which were duly returned to grow a bit bigger. Anyway, darkness fell and the fish appeared to have disappeared as there were no more takes. At one point, I retrieved my gear to rebait and as I swung the lead and hook towards me, I reached out to grab the very small fish that appeared to have been foul hooked. I automatically assumed it was a pouting. For some reason I pulled back my hand before I noticed that the fish was actually a Lesser weever. Now this could have turned nasty. Although venomous, it is not considered life threatening unless it’s a small child/elderly/heart complaint type scenario. But I was alone on the beach and a considerable distance from where the car was parked and a large distance from any medical help. Had I been spiked by this little bugger, I would have a very uncomfortable time packing my gear, getting back to the car and trying to drive myself home or wherever. I have since made up a first aid kit which will always be in my tackle carrier. Even though it won’t stop me being stung, it made me very aware of how vulnerable I was if I suffered any sort of injury and not having any type of first aid available. Even after many years of fishing and being aware of the dangers, it just goes to show how one small lapse of concentration can easily become a drama.